How It’s New York: Playwright Kirsten Greenidge is a member of New Dramatists, the New York-based center for new plays and playwrights. At intermission, members of the audience could be heard discussing their own issues with surreptitious home-buying in the bad old days. 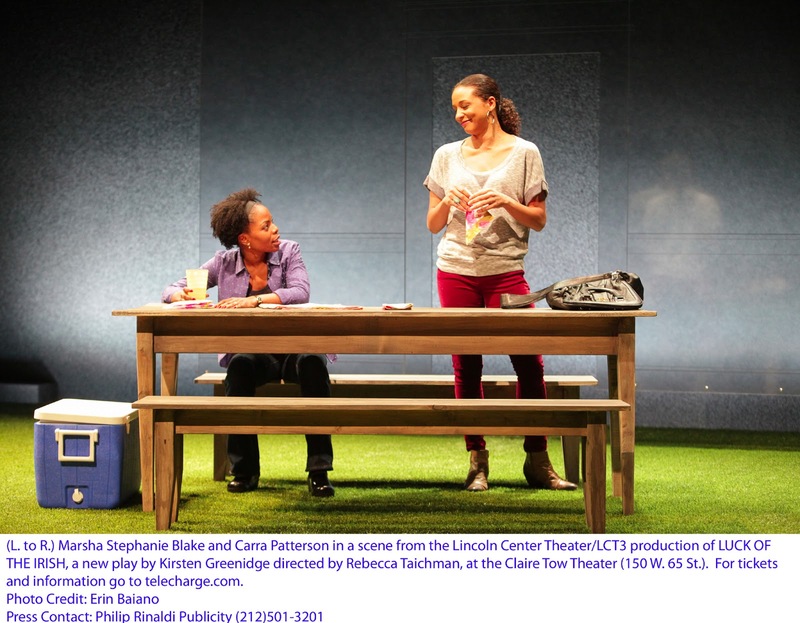 How It’s Irish: In the play an African-American family hire an Irish-American family to front buying a house for them. An earlier version of this review was published in Irish Examiner USA, Tuesday, Feb. 12. Home ownership is a big part of the American Dream. in her new play The Luck of the Irish, playwright Kirsten Greenidge looks at what happens when possession and ownership may not be the same thing. Home is where the title is. Despite good writing, the play falters due to logic issues and stereotypes. Having a home is part of the American Dream. A home with a yard, maybe a swing, a picket fence, a refuge, dominates the emotional landscape of freedom. 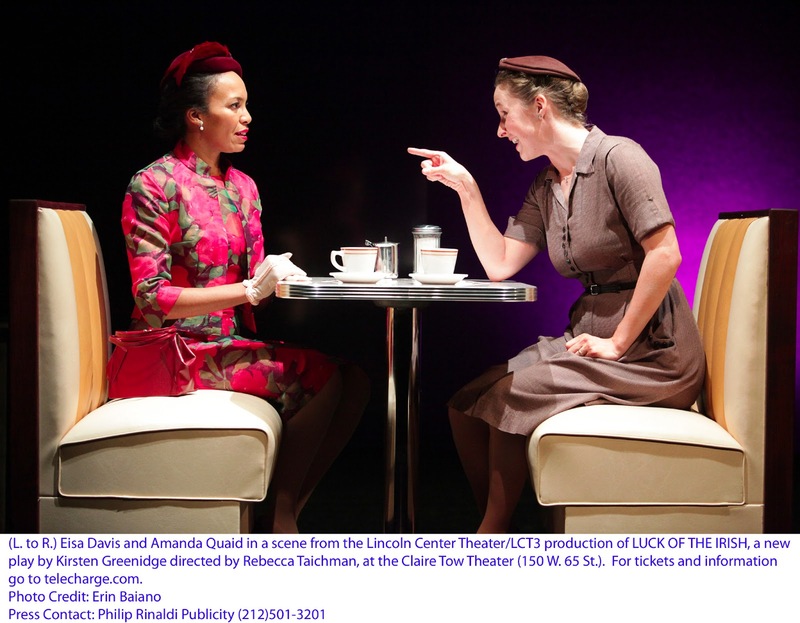 Kirsten Greenidge’s new play “The Luck of the Irish,” running at Lincoln Center Theatre’s Claire Tow Theatre, the small theatre above the Vivian Beaumont, investigates the way a house, an actual structure in a real neighborhood, represents home, identity, a feeling of belonging. The play runs through Sunday, March 10; see www.lct.org. Greenidge looks at an African-American family in a suburb of Boston who inherit a house that grandparents bought in the early ’50s, using an Irish-American couple to front the deal, during a time when refusal to sell based on race was illegal, but not uncommon. Greenidge invents the term “ghost-buying” for the practice. That’s a play on the term “ghost-writing,” but there are also ghosts in the play as it exists both in the ’50s and in the present. Characters from both worlds are sometimes onstage at the same time. And the daughters who inherit the home are haunted by their grandmother Lucy Taylor (Eisa Davis), a highly educated woman who collected buttons. Nessa (Carra Patterson), the younger daughter, thinks there is a real ghost in the house. Hannah (Marsha Stephanie Blake), who has moved in with her husband Rich (Frank Harts) and her offstage hyperactive son Miles, is haunted by the idea of her. That’s all fine, as is Greenidge’s compare-and-contrast look at the upwardly mobile, highly educated African-American family buying a house and the down-on-their-luck, hardscrabble Irish-American couple who take a fee to pretend to buy the house. But the engine of the play, the “what if,” is a mess. Greenidge, whose own grandparents bought a house in Arlington, Mass., using a white couple to buy it, wonders “what if” the couple who bought it never turned over the title. If you’ve ever bought a house, you know that’s not possible. Taxes are assessed based on the title. Unless the couple had gone on fronting ownership for 50 years, this cannot happen. In an article in Boston.com, Greenidge says her grandparents kept up the ruse “until the closing.” Yes. Title transfers have to be notarized. So it makes no sense when, after the elderly Joe Donovan (Robert Hogan) Hannah scours the house for the title. Elderly Mrs. Donovan (Jenny O’Hara), whom we’ll meet in Act II, sends notes, Craig’s List listings, suggestions, trying to nudge Hannah and her family into moving..
It’s one thing to suspend disbelief. It’s another to be asked to enter an alternate universe, where tax rolls are not, as they are in real life, public documents anybody can look up in a minute. Apparently nobody in the world of the play has ever heard of the words “title search,” let alone “real estate lawyer.”I don’t blame Greenidge as much for this mistake as I do the team at the Huntington Theatre in Boston, where the play was first performed, the critics there, and the team at Lincoln Center. What the hell has happened to decent fact-checking and editing? In ten minutes, the “title, title, who’s got the title” issue could be resolved, especially by the highly educated African-American family she’s conceived. Early on, I found myself wondering what separated the play from a slightly better-written TV movie, with its suspenseful premise and its artful dialogue. There are two factors. One is that a TV movie, with its teams of fact-checkers, would have caught this logical error and come up with solutions. Greenidge is creative enough to have come up with another way to keep the two families connected, or to explore the scars that having to use a white family to buy a house might have left. But the other thing that separated her play from a TV movie is positive: it’s art. Greenidge is a true playwright, with an ear for dialogue and an eye for observation. At intermission, people in the audience were talking about their own family histories, with home-buying, with neighborhoods. The poetry underneath the prosaic and faulty premise was touching nerves. The acting is very solid, and Amanda Quaid, as young Mrs. Donovan, Patty Ann, demonstrates the yearning that is making her bitter at her poverty. She’s a bit of a shrew, but she shows an awareness of that that makes you want to reach out to her. Joe, played by Dashiell Eaves, is a dreamer, and proud of it. 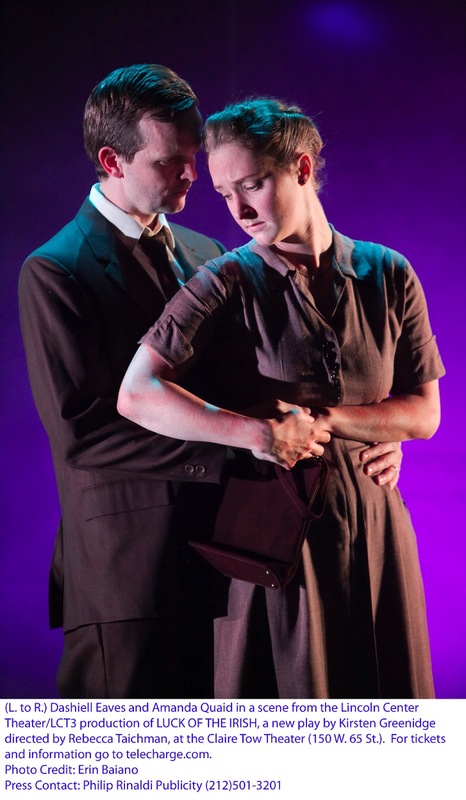 There is a wonderful scene at the center of the play, when Joe visits Lucy Taylor in the middle of the afternoon in the house in Billington. We’ll learn later that he was sent there to ask for more money to turn the title over, but he can’t bring himself to bring it up with the woman of the house. Instead, they talk about poetry. Joe finds common ground with a bored, isolated woman who is trapped into her role of housewife as much as he’s trapped into his role as provider. Davis shows a warmth underneath a brittle aspect of superiority, and when she is surprised by evidence of Joe’s intelligence, it’s beautiful to see. They touch hands and one wonders if they might even become involved. That would have been fascinating. Throughout, director Rebecca Taichman stages the scenes quietly and often delicately, carefully overlapping the eras so that it’s clear what is happening but the resonances linger. As family histories tend to do. But the scene doesn’t lead to another one like it. Instead, we just have a scene of Joe being bullied by his desperate wife. Joe is feckless, literate, and can’t keep a job: “I can’t punch in and punch out,” he says. Add that he’s a drinker and the stereotype would be complete. Greenidge does not go there, fortunately, although there is a moment where Patty Ann complains about smelling liquor on him.Eaves does well with the stereotype, but his Boston accent slips all over the place. He’s not alone in this. Patty Ann, with her disdain for language and literature, contrasts the eloquent Lucy. But it’s as bizarre for an Irish person to sniff at words as it would be for a Jewish mother to sniff at education. Malachy McCourt, whose two-man show written with his brother Frank, “A Couple of Blaguards,” runs this weekend at Irish Arts Center, left school at 13. Didn’t stop him from writing, reading, and being a raconteur. Poetry was often the one thing an Irish family did have. Maybe not shoes, but sure they had songs. English first? Really? Hard to imagine a Boston Irish person having that thought at all. It’s problematical too that after 50 years, Patty Anne repeats almost verbatim a monologue she gave half a century before. But her Irish couple are unimagined and unrealized. Joe’s out of central casting, and Patty Ann is just a generic poor white woman. There is a big Irish community in Boston. And after half a century, for them to be in the exact same situation they had before makes no sense and seems to be there just to make a point. Heck, even Angela McCourt got a Council house. I realize that Greenidge is attempting to explore obsession, which defies logic, but in doing it through the specific lens of ethnic identity she missteps. Despite some beautiful writing, “The Luck of the Irish” is a house with too weak a foundation to stand.